The other day I got an anonymous flier in our mailbox, addressed to “Westwood Resident.” Inside was an unsigned memo inviting us to a “town hall” meeting being held to inform people about a proposed mixed-use development called Woodside Village. I’ve heard plenty about this from our neighbors, including my father, who is not a big fan of the idea. My dad and I don’t always agree on matters of public policy, but in this case we’re both highly skeptical about the proposed development. In fact, it was Jennifer and I who first brought up some of the questions to him that Westwood residents are now (or should be) asking themselves. For a community of 1,500 people, this is a pretty big deal. If all the units filled up, you’d be increasing the population by around one third. That in itself doesn’t bother me at all — a community needs to grow and develop or else risk getting old and outdated, like the Westwood Apple Market, which looks like a relic of the mid-eighties. But are 330 luxury apartments and 35,000 feet of commercial space really what this market is calling for? We’ve already been through this in Kansas City, Missouri, where thousands of condominiums were renovated and made available to a buying public that never showed up. Many of these places are now on the market as apartments and still remain vacant. Nearer to Westwood, places like the recently developed luxury spaces at 47 Fisher can’t even manage to attract rental tenants for a handful of units. As someone currently looking for a place to buy or rent, the word “luxury” is a big turn-off. What’s wrong with “attractive and well-constructed” or even “affordable”? If I were in the market for luxury digs there would already be hundreds of other places to look in areas more exciting than Westwood. Sure, Woodside draws a pretty good crowd to the pool on weekends, but I doubt it’s enough of a buzz to fill up hundreds of luxury apartments. Just my gut reaction there. My question is, do we really need Woodside Village to bring us farmer’s markets, community gatherings, green initiatives and “heavy” landscaping? Isn’t framing Woodside Village as a community initiative and not a commercial venture at least a little misleading? I grew up in Westwood and am living there again temporarily, and the neighborhoods seems pretty alive and well to me without needing to artificially create a whole new upscale sub-community owned by someone in L.A.
My biggest question is how much the city will be on the hook for Woodside Villiage when (sorry, if) the proposed luxury units fail to sell. As a taxpayer in KCMO for the past five years, I’m happy to be contributing to city services there and wish we had the kind of police protection and public works that Westwood, KS enjoys. But I’m not at all happy about the taxpayers footing a huge chunk of the bill for the money-sucking Power and Light district, a centerpiece of the heralded downtown renaissance that our civic leaders at the time convinced us would be a lucrative, energized public realm. I’d hate to see the same thing happen to Westwood just because we got lured in by mentions of upscale condos, green building techniques and farmer’s markets. A more relevant comparison would be the perpetually stalled mixed-use “Gateway” project in nearby Mission, Kansas, currently a wasteland where the mall used to be. Financially, how would TIF-seeking Woodside Village be any different? What’s changed in the economic climate in the last few years that will make hundreds of buyers of luxury residences suddenly materialize in northeast Johnson County? What happens if the project gets stalled or the developer foresees losses and backs out? By the time these details are discussed at Westwood town call meetings (whether citizen-led or developer-sponsored), I will most likely be living in Missouri again, so I don’t really have a dog in this fight aside from my parents living there (and being a past summer employee of the public works department and recipient of the Westwood Foundation Scholarship in 1999). I care about the community and hope that the residents and council members can see past the buzzwords, potential profits and promises of luxury living in order to give the proposed plan the scrutiny it requires. Folks, thank you for all of your concerned comments and lively discussion. By this point it looks to me like the interest/debate/frustration over the Woodside Village proposal is much greater than can be confined in the comments section of this blog. Have any of you considered setting up an independent blog or message board using a free platform such as blogger, wordpress or typepad to host information and discussion about the development? I was happy to attend a few meetings, interview Tanner and some citizens and write about it, but I’ve since moved out of Westwood and do not have plans to write or publish any new content about WV here on this site. If someone does set something up, let me know and I’ll be sure to link to it. You would likely reach a lot more people that way than by continuing to comment on this post, which by now is only viewed by a handful of people close to the story. When does Mr. Tanner make his money? At what point can he no longer care? Find out because it will tell the story. Is the money made in the financing and will Westwood will be left holding the bag? There are going to be several more Planning Commission meetings and several City Council meetings for citizens of Westwood to question every assumption these experts throw at us. The pro forma numbers need to be analyzed by each concerned citizen and not by just Mr Crandall and our elected officials. Let us see each and every assumption on the numbers. Anybody can add 50 apartments for more rent and some more retail to push up tax revenues to make numbers look good on a spreadsheet. Past developments in the Country Club Plaza, Mission, downtown KC and all over the metro are not close to performing at the developer’s projected numbers and several sit in bankruptcy. Mr Crandall, our consultant, says it was just a bad economy–well we are still in a bad economy and it is not going to get much better according to many national economists. What happens in a worse case scenario? Foreclosure? Partially built buildings? Bankruptcy? Do we want to deal with the banks any of this happens? Remember, Tanner is presenting his case from his viewpoint to make us buy in. Do not be fooled by color photos, paid for studies and promises that may be an illusion. By the way it will not just be 250 more bodies in 330 apartments; it will be at least double that. It is our city, our officials have given Tanner plenty of presentation time; it is time to answer every question that has been posed on this blog. Put those answers in Mr Crandall’s updates on the city web site because not all our neighbors can come to every meeting but can access their computers as the number of posts here can attest. get involved and let our city representatives know that you are involved! A final note. 47th Place, as it currently exists, can’t handle the traffic flow of 250 young professionals (approx. 80% of the units) at rush hour. Will they widen that thoroughfare and add traffic lights so close to main intersections that already have lights (west end) and a 4-way stop (east end)? What about crime increases? The Country Club Plaza was mentioned as a positive in the Woodside Village Market Study but it isn’t a low crime zone, and the crime reporting there is definitely understated. I know, I lived on the Plaza for many years. It was neighbor informing neighbor of the crime. One of my neighbors had to stake out his grocery store to catch a nocturnal thief. Turns out it was a Plaza cop. But I digress. What about increased noise at the proposed Woodside Village? Woodside Tennis Club already makes plenty of noise especially in the summer time when the pool is open. The surrounding neighbors bear the brunt of it. Oh wait, we don’t count either. I thought this project was a good idea when I first learned about it. In fact, I prematurely signed a letter of support. On retrospect, there are too many questions left unanswered. Westwood, look directly north of you at the Boulevard Row townhomes on the southeast corner of the 4400 block of Rainbow Blvd. Those modest townhomes were hyped pretty well to our community. The developers (John Hoffman and his associates) evidently got their money up front and moved on. The townhomes seemed to take forever to be purchased. The landscaping is not as well kept as before (I know it’s been a rough summer), and now there is (or was) a big ugly sign out front that advertises townhomes for lease. It looks desperate. If our economy resumes its downward trajectory, will these townhomes become section 8 before their 10-year tax abatement runs out? I only partially jest. I suppose some will say it’s better than what was there before, meaning run down homes or vacant lots and no tax base. And I agree it looks better. But it’s the longtime residents of the community who are paying the increased property taxes, not the newcomers in those townhomes. And no doubt some of them will try to sell before their tax abatement ends. Try to. Westwood, where are the jobs going to come from to fill 330 units? ok…was it Jim Donovan, Dave Buck, Karen Johnson, or Vicky Ross? Some of them are stil serving in official capacities. I should have said former city official who was on the City Council. What city official said this? I have lived in Westwood for many years. The Woodside lease has another twist which has not been mentioned. In 2000 I asked a city official if I could review the lease. The 1999 amendment referred to in the last post was indeed for 30 extra years with a remodel of the south building including a lap pool. Of course, Woodside did not do that project even though they got the 30 extra years at no rent increase. My review of both the real estate lease and a facilities lease did ring a bell when this amendment was brought up. I seem to remember that only the real estate lease was amended. If that is true the facilities lease will run out in 2021. Our outside attorney-Todd? should review these leases and see if this is the case. If so, Westwood could renegotiate the facilities lease to add more rent per month for Westwood in exchange for adding 30 years to the facilities lease. If Woodside does not want to do this, then Woodside would have no buildings, tennis courts or pools to use after 2021. Woodside may have trouble getting financing without this facilities lease. Our city council & foundation should examine this possibility. In no event should there be a rewriting of these leases without some extra rent money for Westwood. This should be done before any discussion on the Woodside Village project since Westwood was tricked in 1999 (per city official) into giving up 30 years for absolutely nothing. Your comments on prior Westwood statements of “No Apartments” is correct. Another Westwood misstep has not been mentioned- the amended lease with Woodside. In 1999 or 2000 the last amendment to the Westwood lease with Woodside gave Woodside 30 more years at the same rent (until 2051) in exchange for a promised renovation of the south side that Woodside never undertook.. This south side building is now the one they say is “blighted” and needs to be demolished. What a wonderful devious concept! The 30 extra years at the same rent is worth hundreds of thousands of dollars to Woodside and a negative to Westwood since we gave up a rent increase with cost of living increases in 2021 for 30 years of extra lease term and received nothing. Why should Westwood residents continue to subsidize Mr. Tanner with TIF and CID incentives since we were played for suckers in the lease amendment? Can our attorneys find no consideration in that amendment so as to invalidate it? The building/land swap deal is also another sweetheart deal for Mr. Tanner. As others have stated, Youthfront gets millions and Westwood gives up city land worth millions for a building Woodside will use for 40 years and then give it up at the end of the lease term.. I believe we residents should present a united front on the “No Apartments in Westwood” slogan and reinforce it with all the real facts(in the past and Mr Tanner’s proposed deal).Yard signs, newspaper & TV coverage and social networking will enhance our position. The Plaza building is an example of concerned citizens taking on developers and city hall to get an unwanted, inappropriate building stopped in its tracks. We should try to organize before or during the August 29th Planning meeting. Exchanging telephone numbers,emails or Facebook posts are all effective tools when combined with media coverage.A united neighborhood front with media exposure is a sure fired method of getting city hall and the developer to recognize our concerns and desires. I welcome any and all resident input on this critical issue for our city. To the Citzens of Westwood: Two elections ago in Westwood a very vociferous group of people stressed as a city council campaign platform “plank” that there should be “NO RENTAL PROPERTY” in Westwood. Now the city council and planning commission seem near embracing the construction of 330 RENTAL apartment units in Westwood. Did I miss something? What’s changed? Police reports show that a significant number of police calls are related to car burglaries at the existing Woodside surface parking lots. Can anyone project the additional burden on Westwood Police with several four-level parking structures? This is certainly a more fertile scenario for burglaries and possibly personal assault than the current troublesome surface lots which offer far better pedestrial line-of-sight visibility for safety. I oppose the entire concept of RENTALS in Westwood and believe that significant further information is owed the public on this proposal. As I read the information to date Westwood will receive ad valorem real estate property tax revenues after the tax increment bonds are paid off in 20 years. What will the condition of the apartments be in Year 2031 or 2033? Does this project simply represent a major negative administrative burden on the city’s public safety, public works and city hall services in the meantime? The Planning Commission meeting is Monday the 15th at 7pm–please plan to attend. Let us get answers to our real questions and not the plain vanilla responses “our” consultant Mr. Crandall keeps repeating. Does Westwood get a 40year old building at the end of the lease in 2051 for its land? Youthfront is getting 4 million dollars now. How is there blight on a Woodside building and property that Woodside was required to maintain under the lease? Why did not the city and the foundation enforce the city ordinances and the lease provisions on proper maintenance? Where are the numbers in the developer’s pro forma? The developer has to have numbers by now after all the architects, lawyers, traffic studies, planning meetings, etc.. We want to know the dollars received and when and what dollars are given up and when(benefits and burdens). Why are we having rezoning hearings for 330 apartments before the numbers and real facts are known? Do we get to see the Memorandum of Understanding, the proposed Development Agreement and all other documents related to this project as soon as our city leaders get them? Is the Developer liable personally for any shortfall in payments on the bonds? This means some real collateral instead of a new company that may may no assets other than the buildings and land with large mortgages on them. We want Westwood residents protected from any defaults. Please plan to attend the meeting on the 15th. Ask questions and get solid answers from our elected officials, planning commission members and the developer’s representatives. This is simply not true. The Traffic Study will soon be posted on the city’s website and is available in PDF from the city. Just go to city hall, fill out a document request form, and the city clerk will e-mail it to you. Materials relating to the Woodside project that are subject to the Kansas Open Records Act are available in PDF from both the city’s website and through a formal request. And to add insult to injury, Westwood now will only provide residents printed copies of any documents related to this project at $.50 per page, even when digital copies exist. The City is obligated to provide information under the Freedom of Information Act, but Westwood’s attorney’s interpretation of this law further erodes residents ability to mount an effective argument against this development — seems folks were getting traffic studies, market studies and other documents that might put a chink in what looks like a slam dunk in Westwood. Developers have considerable resources with which to fight opposition to their projects; looks like they can count the governing body in Westwood as another of those resources. This is incorrect. The City will provide digital copies in pdf format. Also, the Traffic Study is posted on the City’s website. We’ve lived for several years in the City of Westwood. We moved here from Kansas City, Missouri, largely because we became aware of Westwood’s exceptional city services, for example, leaf pick-up, great police service and wonderful, fast snow removal. Our very close friends from Brookside have been looking for a new home in Westwood largely because of how we extolled the benefits of living here. Their goal was to find a house that could be substantially renovated or a modest house on a nice lot and street that could be torn down for construction of a new home. Their budget is in the $550,000 range and for the right property they can go higher — perhaps to the high $600’s. Sadly, our friends have now decided to look exclusively for a home in Fairway, either the original JC Nichols’ section or Reinhardt Estates. Their reason for the change? They believe that several hundred rental apartments with transient tenants will damage Westwood’s reputation and hurt single family property values. Just like most of our friends their house is one of their largest investments. They have been gracious about it, but definite that they will no longer consider Westwood largely because they are confident that Fairway property values will continue to outpace Westwood especially now with apartments. We’re now wondering if it’s time to forget the family room addition and find a suitable home in Fairway or one of the neighborhoods in Prairie Village where high value reinvestment is occuring. Westwood’s time may have passed us by. That’s certainly true of our friends. I believe we residents got glitzy presentation number 3 last night at the Planning meeting. Show up at the City Council meeting on the 11th @ 7pm. We need to be heard by our elected officials instead of another dog and pony show by architects, lawyers and other promo kings.We live in this city, we will live with this project for our whole lives; they will go on to the next project with their song and dance. Apartments with major tax incentives plus a give away of city land for dubious rewards to Westwood should have answers NOW. Where is the pro forma? Where is the selling price for the land? Why is the pool renovation tied to this project when Woodside is doing that and the development team is doing the other? Are there any restrictions on the Westwood Foundation giving up its lease on the land the city wants to give away? Isn’t it a non for profit entity with certain restrictions? Why does Youthfront get millions and Westwood gets crumbs? Do we need our own Non Support petition? These are just a few of the questions for our leaders, Mr. Crandall and the always information disseminating development team to answer NOW! The development meeting last night might as well have been called an “infomercial” for Woodside village. Even though there were dozens more citizens than seats in city hall last night, none of them got to speak until after 2 HOURS had elapsed. Tanner’s team kept talking about “feedback from the community,” but seemed prepared to draw the “introduction” to the project out all night if necessary to keep any of them from having a say in real time. The planning committee seemed happy to let them go on all night, allowing 5 different individuals 20 minutes each to present their plans in detail. “Take as much time as you need,” the chairman told them. By the time the forum rolled around, it was after 9 p.m. and only 6 of the 20 signed up speakers were still in attendance. the message from the planning commission was clear — your voices don’t count. We only want to hear from the guys with the money. If this meeting was about “big picture stuff” than why did they allow the architect to talk for 20 minutes about the play of light and the details of windows while people from the community stood in the back waiting to have their say about the proposed zoning changes and how they would affect the community? Didn’t the development team already get one free “town hall” meeting last month to present their renderings? Over half the planning commission disclosed that they had previously met with the developer in private, so presumably they already knew about the basic details that the team went over in the meeting. Great PR strategy, though: keep talking about how much the community loves the whole thing and how positive they are but don’t give them a chance to talk! If any of you have doubts that the city is acting extraordinarily favored to this project, you needed no further evidence than last night’s meeting. I hope that next city council meeting is different. In the meantime I’d like to know who exactly our city hall is working for: the slick development team with its 1:40 minutes presentation, or the dozens of people who were ignored last night? I am a resident of Westwood. I am very frustrated with this proposal and the CIty’s handling of it. I have attended ALL meetings presented by the City to it’s citizens in regard to this proposed project. We have repeatedly asked questions about the project that have NOT been addressed. The Crandell report issued last year failed to address these questions and has NOT been updated since. Where is a traffic study? Where is the study to determine the effect this proposed project will have on our City services? Where is a detailed account of this “tax revenue” that is to be generated by this project? When are these tax $$ available to the City?? ?-What year?? A person seeking Public Funding loses his presumption of privacy. Both Woodside and Tanner need to make available three years of tax returns, a personal financial statement, a business plan. ANY AND ALL banking institutions require these documents BEFORE considering a “Partnership,” in terms of a lending relationship, with a loan applicant. Aren’t we “Partnering” with Woodside in this proposed developement?? I find it very alarming that the members of the City Council, the CIty Attorney and the Mayor have failed to answer these and other questions asked repeatedly by it ‘s Citizens and yet there is a Planning Commision vote scheduled tonight!!!! Is this democracy?? 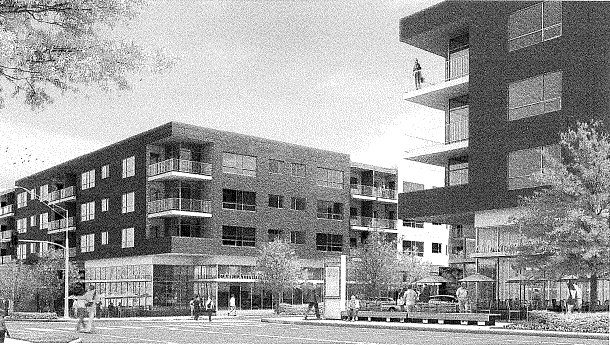 This project is proposed at an abysmal time in the Kansas City real estate market. The flaws: (1) It’s 330 RENTAL apartments, not owner-occupied condominiums, (2) The project’s proposed use of tax increment financing (TIF) and a community improvement district (CID) will take the lion’s share of new ad valorem real estate taxes and — most likely — sales taxes for the term of the TIF & CID bonds which is likely 20 or more years leaving little or no fiscal upside for the city. (3) There has been no study of the negative fiscal impacts on the city of 330 rentals as it relates to additional police, public works and administrative services since the upside will be sucked pretty dry by TIF & CID. (4) There has been no public disclosure of the financial pro-forma feasibility projections for the project; some third-party observers have privately said that the proposed rents may be as much as 30% above current market rate rents. (5) It’s interesting that the “glitzy” promotional materials omit drawings of the project’s four-story ABOVE GROUND parking garages; works of art for Westwood? (6) Just when the City of Westwood has begun to enjoy significant reinvestment in major single family home renovations plus tear-downs yielding exceptional new homes this huge number of rentals will likely discourage or kill additional single family reinvestment. (7) And last but not least a project of this size will likely be sold early in its economic life to an east or west coast real estate investment trust (REIT) with no local ownership or local sense of care for the Westwood community. Follow the money. Lots of questions, few, if any, answers and the wrong project at the wrong time. Good points Frank G. Did you know that Woodside has paid the same fixed rent per month to Westwood for 20+ years and will pay at this same unchanged rate for 40 more years. Sounds like they got the best deal in town and want even more tax incentives from we Kansans. Apartment dwellers pay no property taxes and I will bet that there is a real estate tax abatement for the apartments in this deal. We will pay the sales tax increase without even voting on it and he gets that extra money in a Community Improvement District for his project. The BIGGEST point is Westwood has NO APARTMENTS now. Do we want to open this door to apartment dwellers and change zoning to allow apartments throughout Westwood? This will be a major change in the way Westwood develops in the future. Part time residents do not add much to the fabric of a city. Mr Tanner will be long gone by the time we get any real benefit from this deal. August 1, I will be at this meeting and ones in the future. Mr Tanner is asking the city of Westwood to give him the land in exchange for a building the city will own in 40 years.He is paying 4 million for the Youthfront property next to Woodside with about the same acreage for part of this project. He asked for government incentives for “blighted” buildings that he was obligated to keep in good repair per the lease he has with Westwood. He also wants a tax addition on the retail sales at the new retail shops to help pay for this project. Should the city sell city land (Westwood owns the land and the buildings) to a private developer? Why not sell all Westwood parks and City Hall for $$$$$? Why not get millions of dollars for the land if you are selling like Youthfront? August 1, 2011 Planning Commission meets. Voice your concerns, ask serious questions and get answers not smoke and mirrors. Questions are good. Has anyone (including this blogger?) tried approaching the principals involved to get these questions answered? From what I hear, the “developers” are very open to speaking to anyone about their questions and concerns. So before people make up their minds against (or for)…..lets become active and get these questions answered. Then we can each make an informed decision…not one based on what we think, but answers to our questions. You make a good point — decisions like this require one to be/get informed. I wasn’t able to attend the meeting at Westwood City Hall, but some neighbors and family attended and I had one of them bring back the information packet for me. The color renderings within are obviously more attractive than the image here (pulled from the online flier), and the biggest thing I learned was that the anchor store for the development is a “Green Acres” health food store (greenacres.com) like the one in Briarcliffe, North KCMO. I was also curious about the ratio of public to private funding, which I gathered from one of the “principals” (not sure why you put “developers” in quotes — I think it’s more accurate a term than “community builder” at this stage) is 25% public — better than I thought but obviously the city is still on the hook for a lot in a project of this scale — correct me if I’m wrong. So… the information I have gathered indirectly shows the “idea-havers” behind this are doing their best to come up with an attractive proposal. I also trust that the elected city council members are scrutinizing the numbers and trying to make the best decision they can about this. They undoubtedly have more information than I do at this point, though I do plan to stay informed and attend further meetings if possible. If we’re not supposed to make a decision based on what we think, as you say, than I’ll go ahead and tell you my gut reaction, i.e. how I feel about the whole thing. I’d really like to see something like this succeed. Having grown up in Westwood, I always felt like I had the best of both worlds — got to go to good public schools, was close enough to 39th Street, Westport, Plaza to ride my bike or walk. Safe, attractive neighborhood. I think there are plenty of other people who would like to live there as well, and the city could also use a tax boost after the Sprint facility was taken over by KU Hospital. The grocery store looks nice, and so does the new deck furniture in the artist’s renderings. Again, this is just my gut feeling, having seen many of the disappointing stories in Kansas City, MO in the past 6 years, and having spent the past few months trying to decide where in the area to buy or rent. Unfortunately no amount of figures presented to me by a principal or private consulting firm can guarantee a success. They have their job to do — which is to try and get the thing approved, built and sold. And as a blogger and private citizen, I’m here to contribute to the discussion and try and look at the big picture. Bottom/head line on WWV? Attractive, ambitious project seeks to bring a slice of L.A. luxury and green living to sleepy Westwood, KS. Huge coup for the city, or another Power and Light / Gateway? If you build it, will the people come? I like the approach you’re taking here. It’s simple – ask questions – but it’s something that I don’t feel like a lot of people are willing to take the time to do. As a resident of Roeland Park who gazes upon the stalled wasteland that is the Gateway project daily, I feel like the citizens of Westwood would do well to take that time. The first red flag here is the developer trying (not very hard, I’d say) to entice Westwood citizens with the “community building” aspects of the development to distract from the very real fact that he doesn’t even reside in the state of Kansas. It seems like every week, another local business closes on Johnson Drive. One reason for this is that its anchor and most visible point – Mission Mall/Gateway – is beyond dead and now serves only as the connective tissue of citizen gripes. I’ve heard it brought up at city meetings on everything from a proposed wastewater improvement project to the new park on the old Roeland Elementary site. It’s also easy to connect the failure of this development to the new “driveway tax” in Mission. The proposed development in Westwood will undoubtedly affect what little local business there is left, and it will eventually affect the psyches of its citizens – whether it gets built or not.